Perhaps one of the biggest and best Smith cages in the world, the Marcy Diamond Elite Smith Cage is definitely a force to be reckoned with. This high end home gym actually comes in at a decent price for what it is, especially considering just how durable and functional it is. This bad boy comes with a large number of possible exercises that can be done on it for a full body strengthening experience. If you would like to watch a little video overview of the Marcy Diamond Elite Smith Cage, you can check out the little clip below. The Marcy Diamond Elite Smith Cage System MD-9010G has a large number of features that we really do like. The Marcy Diamond Elite Smith Cage is definitely big and heavy. While it is not as heavy as some of the other high end home gym options, it does not actually come with the weights, which makes a huge difference. Other than that, this Smith cage does take up a lot of space, but that also means that it has many functions. In fact, this is one of the bigger high end home gyms out there at this moment. 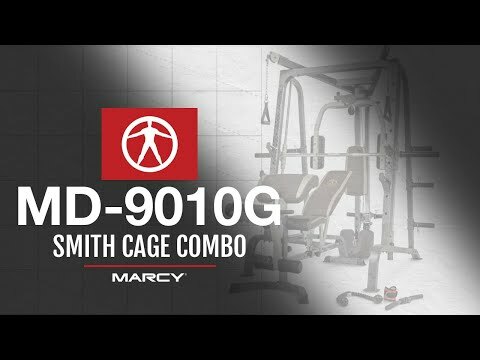 The Marcy Diamond Elite Smith Cage System MD-9010G does have a decent warranty for what it is and the decent price it comes in at. The Marcy Diamond Elite Smith Cage comes with a 2-year limited warranty on all parts. Assembling the Marcy Diamond Elite Smith Cage is not all that difficult. It is pretty big and heavy, so it will take a decent amount of time. Also, it is recommended that you have someone help you set it up. The instructions are pretty clear, but you will need a couple of tools. All of this being said, while assembly is not easy, it is not nearly as challenging as with other models, especially ones with weight stacks. This being a free weight Smith cage, it does not require the setup of any weight stacks. Here is a link to the assembly manual. The Marcy Diamond Elite Smith Cage does have a few awesome features that we can definitely stand behind. So, what are these great features? One of the things that we do like about the Marcy Diamond Elite Smith Cage is that it is fairly safe considering that it is a free weight home gym. This model features a safe frame design with a seven-degree slant to accommodate for the natural motion of your body. Moreover, the Smith bar is held safely on a gliding rail that does not allow it to tip over in any direction. Also, there are a number of safety stoppers and catches included as well, both of which will stop the Smith bar from crashing down on you. We do also really like the seat/bench that the Marcy Diamond Elite Smith Cage System MD-9010G comes with. The bench can be flat or inclined for various exercises, plus you can sit on it backward and combine it with the footplate for seated rows. The seat itself can be adjusted for height and position to accommodate different size people. Moreover, the seat has great padding, plus it also has a vinyl cover to increase its longevity. Another thing that is very impressive about the Marcy Diamond Elite Smith Cage is that it comes with a high number of exercise choices. Aside from the Smith bar and the bench that allow for bench presses and incline presses, this model also features a preacher curl pad for your biceps. The Marcy Diamond Elite Smith Cage also comes with a dual function leg station for leg curls and extensions, plus the leg station also has a handle for curls and rows. This model also features high dual crossover pulleys for a number of arm and upper body exercises. It also features a pectoral and deltoid station, plus it comes with a lat bar, a triceps rope, and ankle strap, and 2 single handles. All in all, you can work out virtually every muscle in your body with the Marcy Diamond Elite Smith Cage. This is a really great item if you want a full body workout. Something else we like about the Marcy Diamond Elite Smith Cage System MD-9010G is that it comes with plenty of storage space for weights. It features 6 storage pegs for Olympic weight plates. So, in other words, the Marcy Diamond Elite Smith Cage can hold more than enough weight for you to lift. There are just a couple of things that we don’t really like about the Marcy Diamond Elite Smith Cage System MD-9010G, so what are they? One of the things that we don’t really like about this particular model is that it does not really come with anything to work out your core. Core workouts are the only thing missing from the Marcy Diamond Elite Smith Cage that we would like to see included. Something else that we don’t really like about the Marcy Diamond Elite Smith Cage is that none of the weight plates are included. Having to buy your own Olympic weights is going to increase the price of this item significantly. To give you some perspective on what you are buying, let’s compare this Smith cage to some of the other top high end home gym models out there. The Inspire Fitness FT2 Functional Trainer is one of the best home gyms out there. It is considered to be safer than the free weight Marcy Diamond Smith Cage. Also, the FT2 takes up a little less space, plus it is lighter as well. Moreover, the Inspire Fitness FT2 has the ability to provide you with more weight and resistance than the Marcy Smith Cage, plus it has more exercise options too. On the other hand, a big factor here is price. The Marcy Smith Cage is going to cost you much less than the FT2. The EXM3000LPS is a good alternative to the Marcy Diamond Smith Cage. To be clear, the Body Solid EXM3000LPS is a light commercial gym with dual weight stacks, whereas this Marcy Smith Cage uses free weights. This does mean that you need to buy separate weights with the cage. However, what is convenient about the Smith Cage is that it is a little smaller and a heck of a lot lighter than the EXM3000LPS. The EXM3000LPS does provide for more workout opportunities than the Marcy Smith Cage, but it also costs a substantial amount more. If you are really serious about weight lifting, the Marcy Diamond Elite Smith Cage will serve you very well. Aside from having to buy free weights, this item is very affordable considering that it is a high end model. It comes with a quite a few accessories and workout options, so it does make for a prime weight lifting tool.